Perhaps I kept the book as a secret; because I was not sure that I’ll be able to finish it to the end. But YEAHHH I did it with all god’s welling , family support & editors help @ PacktPub. The book was out last month, online and printed, but I was waiting to get my copy to take a nice photo of it for this post. 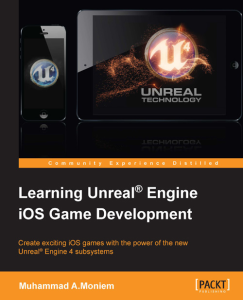 really glad to put this book out, and putting lots of valuable information either regarding the process of creating iOS games or regarding Unreal Engine iOS games creation process and tricks. The “nGUI to uUI” tool is out!